RDT Pacific recently delivered a very exciting addition to the Battle Training Facility at Papakura’s Ardmore Military Training Area. 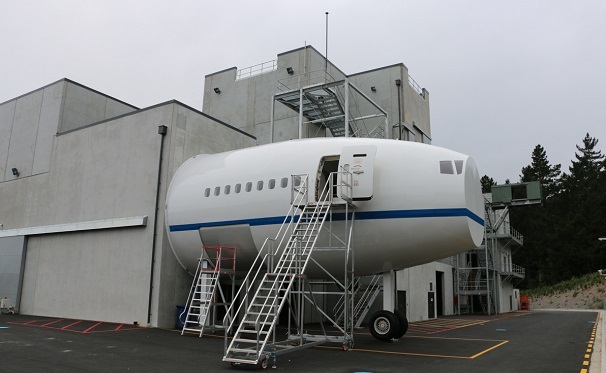 A mock up of a commercial aircraft fuselage will enable the New Zealand Defence Force to conduct a variety of realistic training exercises. The full-scale Boeing 777 aircraft simulator contains authentic passenger access doors, as well as internal fit out items including overhead lockers, a galley and external nose wheels. On board electrical systems include ventilation, extraction, lighting, communications and CCTV. A cockpit door can be wired with an explosive charge, and epoxy coated walls enable hit marks from non-lethal ammunition cartridges to be easily wiped off. Adjacent is a live firing area, to extend exercises beyond the interior of the aircraft. Air New Zealand kindly donated the galley and aircraft seating to add extra authenticity to the space. The fuselage was custom designed and built by industrial engineering specialists SPI Industrial Engineers, and the project managed by RDT Pacific’s Ivan Ravlich. The fuselage installation is part of a $46 million modern purpose-built facility, which opened earlier this year to provide fit-for-purpose training capability for Special Air Service personnel.